Has anyone skied at Corey Pickos’ place in Santa Rosa Beach Florida? I am going to be down there for a week and I am hoping to find a little time to sneak a few sets in. My cousin went there and said he received very little instruction (though he was very beginner). I don’t want to haul my gear all the way down there if I am just going to get a pull through the course and no coaching. Any input would be great. Thanks. What are you kidding? Bring your Gear. Currently at Cory's is Dan Ardvarko, Regina Jaquess, Both Adam and Cory Picko's, Stephen Seal, and a few others that I can not name at this time coaching and skiing their. Was their over the weekend and skied with Regina, Adam P, Cory and Ardvark had a great time and afterward we had a great Mexican Dinner. Thanks. When I say my cousin was a beginner, I meant he was learning to wakeboard there (his first problem) and he had never done it before. I only ask because he had some younger kids driving him and I guess they gave him no instruction at all. I will not be wakeboarding though, and it sounds awesome. I am definitely going to line it up. Thanks again. The only problem I've ever had there is a grumpy driver who gets all worked up about safety then takes you to a public lake and dumps you in with gators lurking. Am I the only one who sees irony in that. But he does give a darn good pull. @WBLskier I was down there for a few days this past summer. Great site and great people. Not to mention they know what they are doing. I skied with Dan and Corey ( and another guest coach) while I was there and got to see some great skiers ski as well, Regina, Adam, (Corey took a set), Dan, Adam S. and some guy named @Jody Seal was hanging around too. Never a dull moment you will have a good time and lear a lot. The gator's wernt that big! Whats the problem? I have skied at Corey the last three springs. If you are a three event skier, you can't do any better. 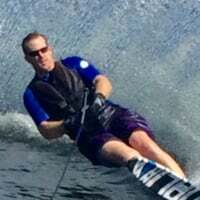 If you are a slalom only skier, you may be able to get better coaching somewhere else, but I am a level 8 skier and have been nothing but fully satisfied. One key to getting out of ski school what you are hoping to get out of ski school is to tell them up front what you are trying to accomplish. And don't forget that it is your job to show up fit enough to ski enough to ski long and hard enough to accomplish something. Hint: If you spend the whole week working on your gate, someone thinks you are out of shape. By the way, one of the things I like best about Cory's is that there are a lot of very good junior skiers there. In my mind, it is a lot cooler to hang out with the juniors (the up and coming heart and soul of the sport) than a bunch of old guys from New York. BTW, I am 55. And from NY. Go Giants! Amazing place -- Nobody works harder than Cory. My brother and his wife had a great experience at Corey's. Beautiful location as well! I know of a great rental condo on the beach, if you need lodging? Jody, any idea when Cory is having tournaments there this year? Regina told Charles and I to come over, so we want to make a road trip. to Panama City or be canceled or???. Jody, REL and class C?? Or just R. USAWS shows R only and just one price. Is there any F entries allowed? It's for my daughter. Any camping available on site? When r u back in Orlando. Offer to ski here still stands.